Hello and welcome back! I'm back again with our One Stamp At a Time Blog Hop. This month our theme is Let It Snow, so you're sure to see many great ideas for the upcoming holidays! I made two cards and two gift cards using the Stitched with Cheer and Festive Season Stamp Sets. I also used the Softly Falling and Seaside Textured Impressions Embossing Folders. I started by running Soft Sky Cardstock through the Seaside embossing folder. The greeting is stamped in Basic Gray. The small solid snowflake is stamped in Soft Sky, and the other three snowflakes are stamped in Pool Party, Bermuda Bay and Smoky Slate. 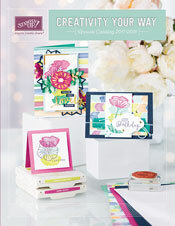 Don't you just love these new Stitched Shapes Framelits Dies? I think they are fun to work with. Two banners of Silver Foil Sheets and Silver Glimmer Paper. I used some Whisper White Baker's Twine and sequins from the Silver Sequin Trim. The two circles are also popped up on Stampin' Dimensionals. I used many of the same supplies for the gift card, but added Silver Metallic Thread for the main accent. The greetings in this set are so fun, and they include little touches like the rays that fit above and below the greeting. For my second card, I just turned the layout 180 degrees and continued with design. This used the Softly Falling Textured Impressions folder. All the stamping was done on Shimmer White Cardstock, so it looks extra shiny in real life. And here is the second gift card. I love how all of the little snowflakes look together, especially in multiple colors. Here is the color combination that I used today. Well, that is all for today. Please continue on the hop to the next stop at Maria Willis by clicking on the button below. Or, the full list of links is further below. Thanks for stopping by today!